(Newser) – Just a half-hour into the vice presidential debate out of Virginia's Longwood University, a winner had already been declared: Indiana Gov. Mike Pence. Not because he was creaming Virginia Sen. Tim Kaine, but because the Republican National Committee put up a premature post on the GOP.com website. "The consensus was clear after the dust settled, Mike Pence was the clear winner of the debate," the now-scrubbed post read. 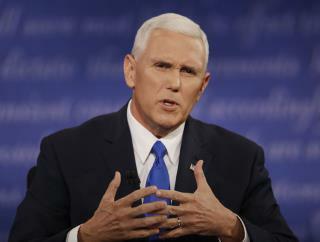 Pence's supposed verbal victories: his take on the economy and "highlighting Hillary Clinton's scandals" (which, as of the time of this post, hadn't yet been addressed). & the next Headline will be... Get ready to Turn ON your Computer,Smartphone,Tablet, HDTV 4K Smart TV, or if u still have the old ANALOG TV, TRUMP Will WIN the 2nd round of the POTUS debate on Sunday 10/9/16! Due to HIM giving us unequivocally & given clearly, Without Causing Doubt And confusion That HIL(LIAR) is a... WACKY,SHORT CIRCUITED,CORRUPT,EXTREMELY CARELESS & A PATHOLOGICAL LIAR to the Legal American Citizens !! This time around! There ya go ALL! . turns out to be prophetic. I'm writing in Bernie Sanders, none of this interests me.